Peer out your living room or bedroom window and get a view of a lifetime; the ocean is right outside your door. Amazing vacation home sitting on the ocean! his is the upper duplex. This three-story rental has one full kitchen and a wet bar with granite counters, decks off of the living room and master bedroom, and spa! Beach level of a gorgeous oceanfront triplex with a very spacious beachfront patio, a large kitchen, and warm living space! Charming beach rental studio with a fully furnished kitchen, BBQ, shared outdoor patio, and a shared semi-private beach. Amazing triplex sitting on the tranquil beach! If you have a large group, this home is for you! 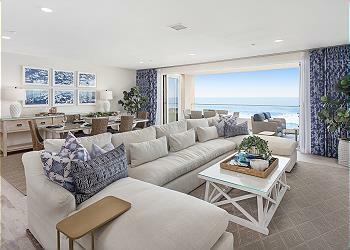 This four-story rental has two full kitchens and a wet bar with granite counters, travertine floors, an oceanfront patio with a private spa, BBQ, and more!